I can use your automation tool to ‘bring to light’ the control on the VST GUI from the sea of possible controls, then use the standard Renoise controls to add that param to the pattern data. Thats a workaround. I wonder if it’s possible to transcribe automation window ‘points’ into the pattern data. It’s just that generally I prefer to hammer numbers in rather than work with the curves or points in the auto editor … but your method here of picking up a VST control and then manipulating it is awesome. The transcribing to pattern could be done, it could be a bit tricky on implementation due to the fx lanes allowing any command anywhere i.e. not having dedecated fx lanes for each command. I `m sure some compromise would be possible though. Well, it’s pretty damn great as it is… if it never changed it’d still be great. Two new shortcuts added for faster browsing through your automated parameters. They will open the automation lane if it isnt already. Unlike the tools gui selection method, you dont have to choose the next device manually, these shortcuts just take you up and down the renoise automations list. 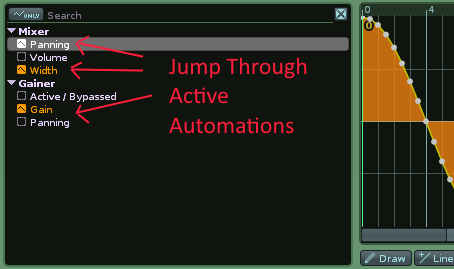 Make a selection in the automation editor, press the shortcut and that selection repeated after itself. Writing from vst control can be done and was already made in my tuned shortcuts tool. It works. But it is unstable, renoise can crash, especially with old vsts . Are we talking a hard crash that takes down Renoise (with or without saving a backup), or a scripting error (with or without a warning message)? bugfix: also updated the automation writing function so that it will overwrite dots that occur between lines.